Israeli settlers attacked, late Friday night, the cars of Palestinians traveling on roads in the northern West Bank, causing damage but no injuries, according to local WAFA sources. Settlers reportedly threw rocks and bottles at Palestinian cars driving on a road between Jenin and Nablus near the village of Silat al-Dahr. They said damage was caused to some cars. 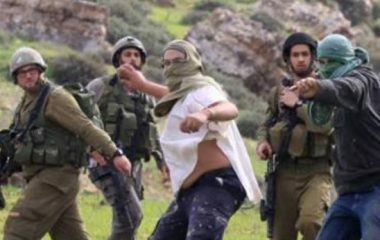 Settlers had previously attacked and almost lynched two young Palestinians south of Nablus. Sources said that over 100 settlers stopped a Palestinian car near Zatara (Tapouach) army checkpoint, in the vicinity of the village of Kufr Qalil, early Thursday, dragged its two passengers out after attacking and breaking their car and started to beat them severely. They were rescued only after a Red Crescent ambulance arrived in the area and was able to get the two young men away. They were taken to hospital for treatment with cuts and bruises all over their body. In both incidents, and many others in which Jewish settlers attack Palestinians, the Israeli army or police have not arrested anyone.